Today we’re welcoming guest blogger Andrew Gilmer, a part-time volunteer for Slow Food South Texas. He likes knowing where his food comes from and how it was raised. He started visiting farms in an attempt to become more educated and see with his own eyes how small local farms operate. After reading Michael Pollan’s “Power Steer” in the New York Times, Andrew decided he needed to be more proactive in food education and promoting local farmers who raise produce and animals using methods inline with Slow Food’s values. This mother is closely guarding her piglets prior to start of the castration process. That’s right people, this post is all about hogs’ balls. There, I said it. Good, you’re still reading, so let’s get on with it. A few days after my piglet visit, Mark and Kelley invited me back to South Texas Heritage Pork farm for Castration Day. Being no-nonsense farmers they were very upfront about what I was going to see. ”This is one of the hardest days on the farm. We don’t look forward to it, but it is necessary,” Kelley said. Castration is necessary for many reasons and has been a tradition in farming since animal domestication and husbandry began. Before we get too far along, let’s define a few hog terms that will be used in this post. 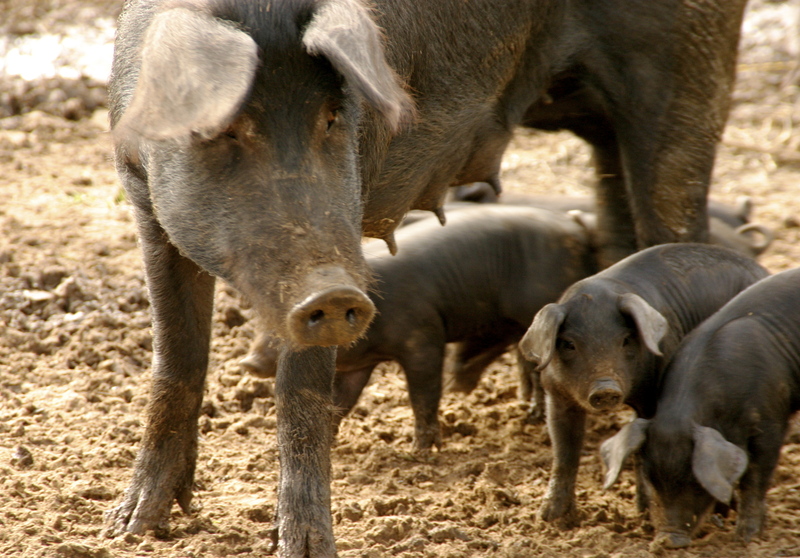 Sow = a female hog who has given birth to at least one litter. Gilt = a young female hog. Barrow = a castrated male hog. Boar = a intact male hog, aka, a boy with balls. There are three main reasons why the Escobedos castrate their animals. 1: The quality of the pork. High levels of testosterone significantly alter the taste of the pork, giving it a musky odor and flavor. Removing a hog’s testis removes the primary source of testosterone and prevents the musky flavor. 3: Available pasture. South Texas Heritage Pork only has so much land available for pasture. The boars have to be kept separate from the rest of the herd because of reason number two. Often times, they also have to be kept separated from other boars to prevent fighting and injuring each other. The Escobedos insist that all their animals have access to fresh pasture, and refuse to keep their boars in a small pen. The solution is to provide the hogs access to two separate pastures, a large one for the main herd and smaller one for the boars. In addition, the Escobedos only keep a small number on boars on the farm. The other males must either be castrated, or sold intact as breed stock. With all this mind, I somehow convinced my wife that “Castration day” would be a great family Sunday outing. She agreed, not even reluctantly I might add, and so we loaded up our 18 month old daughter with enough toys and snacks for the hour drive south, and departed for Floresville, TX. When we arrived Mark was out in the field with his son Michael; Kelley was still in town getting supplies. Shortly after we pulled into the driveway, a pickup I didn’t recognize pulled in. Upon seeing my family and this pickup arrive, Mark came in from the field to greet us. After a quick handshake for me and a big hug for driver of the pickup, I was introduced to John. 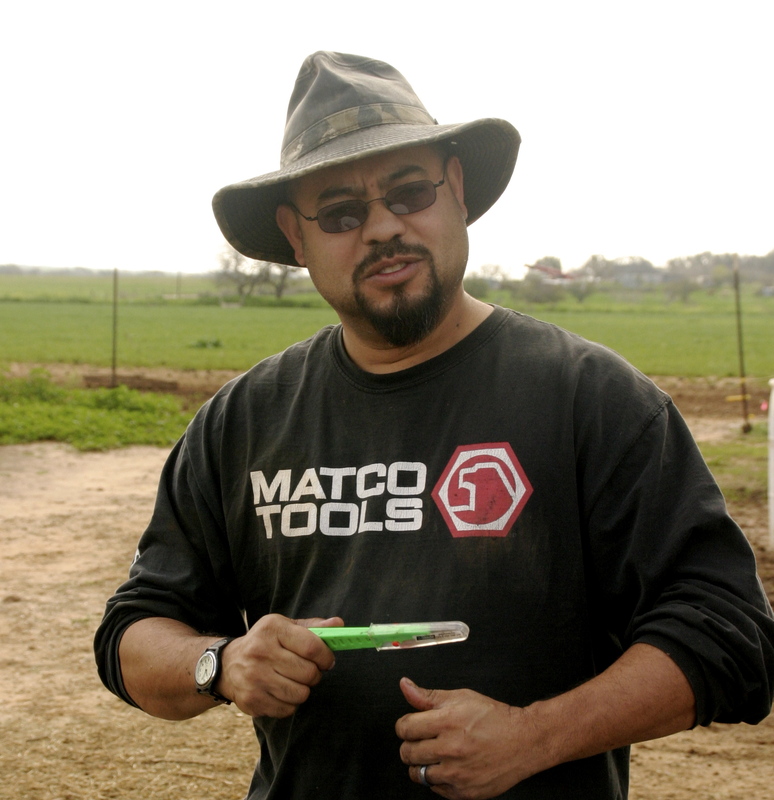 I learned from Mark that John was Mark’s long time friend, and the Escobedos’ designated “castration guy.” He was trained as a Paramedic and is now an instructor, and spent many years working on people before picking up this odd side job. After hearing his background, it was obvious that John possessed the prefect skill set of steely nerves, quick hands, and a cast iron stomach. His years of experience responding to medical emergencies, and practicing minor surgeries on humans made for an easy transition to performing minor surgery on piglets. John, full-time paramedic and part-time "castration guy." Soon after the introductions were completed Kelley arrived, and we began the task at hand. The work station setup and tools were surprisingly simple. I watched as John and the Escobedos cleaned a tall food grade plastic barrel to be used as a table and then took inventory of their supplies. The equipment consisted of a bucket of warm soapy water, a new clean wash cloth, a brand new sterile scalpel, and a few different types of infection preventing topical ointments that are designed to heal cuts. When I commented on the simplicity of the setup, they explained to me that the hardest part of the actual castration process is separating the young piglets from their sows. According to Animal Welfare Approved standards you must castrate a piglet within 7 days of its birth. This period can be extended to 14 days for health reasons, but after that castration is no longer allowed and the piglet must be kept intact. As I mentioned in my post, BECOMING GREAT MOTHERS, if the sows feel threatened they are very protective of their young. Mark and Kelley know this, and ensure the sows are kept separated from the piglets during the castration process. They also know from experience that once the piglets are castrated the quicker they are reunited with their mothers the less stress for everyone involved. Their solution is a few layers of safety fencing in the barn, with the innermost area designated as the castration area, and the outermost area connected to the pasture where the sows and their litters normally spend their time. Suddenly, I hear a piglet squealing followed by the oink of a sow (pigs don’t really oink, it is more of a grunt, but after reading thousands of children’s books in the last 18 months it just doesn’t feel right to write anything else). The squeal isn’t one of pain, but surprise, as Mark has just picked up the first piglet and they are rarely handled at this stage of their life. I am surprised too. Kelley had taken my wife and daughter inside for a chat, while I had been busy changing the settings on my camera for the lighting conditions in the barn, and didn’t realize that John, Mark, and Michael had started. I also had not yet scoped out the best place to stand during this whole process, something I began to regret as the first sow came charging in. I swore at myself and quickly hopped the first layer of safety fence into a sturdy crate and began snapping photos. Michael holds a piglet while John performs the surgery. Mark is holding the on-deck piglet while Blondie voices her concern for the members of her herd. Once they began, the process was quick and efficient. Mark picks out the boys of each litter, and brings them one at a time to Michael and John. Michael turns the piglet on its back and John washes the piglet’s legs, stomach and scrotum with the warm soapy water to ensure it is clean prior to the castration. Then he takes the scalpel and performs a quick incision, pulls out the testicle, and removes it with a quick slice of the vans deferens. The procedure is similar to a vasectomy, but in this case the testis are completely removed. After removing the testis, John applies infection preventing ointment and then Michael returns the piglet to outermost area to rejoin its litter-mates and sow. As soon as Michael sets the piglet down it stops squealing, runs over to its mother and appears no worse off then before the castration. John carefully inspects prior to making an incision while Michael holds the piglet. During a pause after the first few castrations, Kelley and my family returned from their kitchen chat. My wife, Sharon, and I decided to swap roles. She was going to play photographer while took on parenting duties. As we traded camera for child, Sharon whispered in my ear that Kelley was visibly distraught when the squealing had first started. I was a little surprised but quickly realized I shouldn’t have been. It was just one more example of the Escobedos’ feelings of respect for their animals. As my daughter played in the pasture, I watched from a distance as Kelley tried to calm the next piglet by placing her hand on its head. The scene reminded me of watching my daughter get her first vaccines as a little baby. She was scared and crying. Sharon and I were a little scared and crying. But the shots happened quickly and while there was a cry of pain, it was soon soothed by the reassurances of mom and dad combined with a little nursing. This piglet reunites with his mother post-operation. No one ever wants to intentionally cause something stress or pain. Unfortunately, sometimes a little pain is necessary. For the health of a baby or in this case for the health of a hog herd. Piglets stay close to their mother in the pasture post-operation. Today’s post was originally published on Slow Food South Texas‘ blog, The Hog Blog, on March 24, 2012. 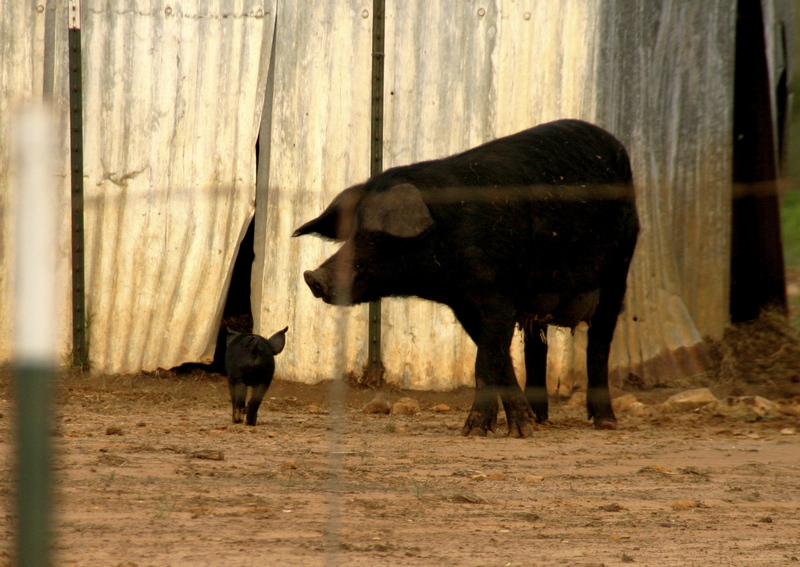 The objective of The Hog Blog is to follow an animal through its life cycle from farm to table. The goal is to compare and contrast all aspects of “conventional” large-scale factory farms and “traditional” sustainable farms. In collaboration with local San Antonio chefs, Slow Food South Texas will be serving a heritage hog, “snout to tail” during their fall 2012 Harvest Gala fundraiser event. 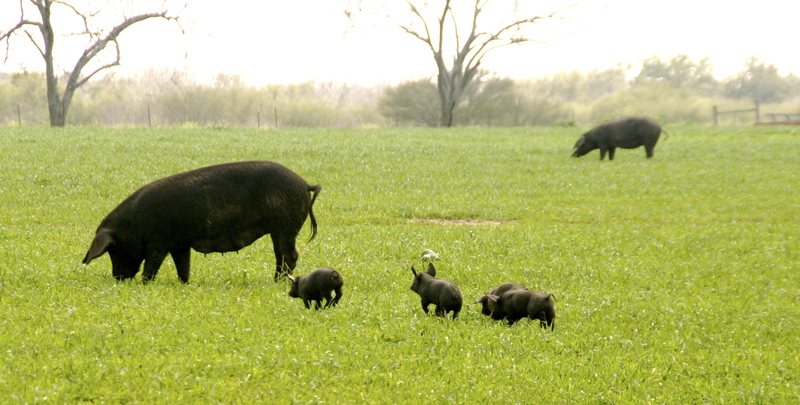 Mark and Kelley Escobedo, owners and operators of South Texas Heritage Pork, have been kind enough to open their farm/home to Andrew’s prying camera lens and greenhorn questions in order to document the major milestones in the life of a Large Black Hog. Boring legalese we feel we must include: this was written by a real live person who has their own opinions, which we value, but that do not necessary reflect, though they may (or may not), reflect the values and opinions of Real Time Farms. That is for you to guess and us to know. This entry was posted in On the Farm and tagged andrew gilmer, animal welfare approved, michael pollan, pig castration, pigs, Real Time Farms, Slow food, slow food south texas, South Texas Heritage Pork. Bookmark the permalink. This is a great article. Thanks for sharing! Our very special thanks to Andrew Gilmer. An extraordinary individual who educates us as much as we could have ever hoped to educate him. His passion for food transparancy will make a difference in people’s lives. We also thank Real Time Farms for having us as a guest on their blog and Slow Food South Texas for their role in educating the local community about food. I find the sows are spared undue emotional stress if the piglets are taken out of squealing and siting range. This photo shows her looking on, which is not good. Removing the males while she is eating is a good tactic. Yes, very good point. The moms are separated safely from their babies. The sow picutured is a pregnant sow that was way out in the field minding her own business until she decided to investigate what was going on inside the closed barn. She definitely has her own unique personality and we haven’t found anything that will keep her in our out if she really wants to go somewhere. She busted right into the barn and began voicing her concern for her herd. She trusts Mark completely though and is much more bark than bite. We did move her to another pen before we brought in any more babies. That was really informative. Interesting to know about the gruesome realities of the castration process and the reason behind the process, esp. how testosterone affects the taste of pork. Thanks for posting.